If you're like me, blink and the summer will be over. I want to make sure to plan for all kinds of great and fun things, including what kind of things we've got going in the garden, canning and preserving. And here are some links that go along with the show and the things I talk about. This deep magenta rose, as lovely as it is, is no longer behaving and is going to be taken out. And these are the euphorbias I'm editing down. Here is how we make strawberry freezer jam. 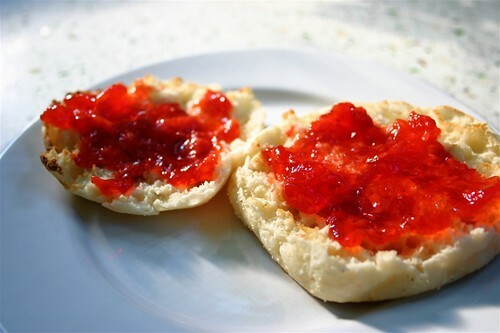 Pomona's Universal Pectin is a great solution for creating low or no sugar jam. Yes, there really is a recipe for knotweed jam. Eat those invasives! Here is my source in Seattle for tumbled glass, great for top dressing potted plants. And here is a link to my favorite plant sale of the season: the Clackamas County Master Gardeners Spring Garden Fair. And can I just say, thank you to the thousands of you (yes, I learned the number and it's thousands!) who are listening to my show live when it airs. If you have questions for me, or comments, I welcome them: please leave me a comment here. Also, next week I'm answering some great questions from a listener, but if you have a topic you'd like to hear more about, just let me know. Thank you so much! God, I love you and all your relevant and interesting links. I can't wait to sit down and listen to your show for once! And yay for having back episodes available already! I can get caught up while it's still just a couple. Glad to hear the show is going well! I'm so happy the show is doing well! i am listening to it all now !!! both of them. it was easy to figure out. So exciting. Well done! We use Pomona's too. If you want to save some money, you can buy it in bulk on Amazon too. It works out to be about $3.88 a box. Granted, if you buy the 1lb from the website LeAnn listed, it is $3 an ounce. I'd love to hear more about how you started in your yard. What made you decide to take out the lawn? How did you decide what to put where, bla bla bla. I have a plan (cue Battlestar Galactica cylon theme) and it's starting to take shape, but feels as if it'll take forever. A little inspiration would be just the thing while I'm digging up more and more of that blessed lawn. i listened to them both. both shows, and i enjoyed them. i love the idea of the pizza oven/ asada. i have a question. coffee grounds, do you just spread them out all over the top or mix them up in the dirt? and are their certain "crop" that this might be a better served with coffee grounds. thanks for the comment on my blog. pro-activity goes a long way. Jacquelyn-I'm still getting into my grooooove with this audio thing. I think the second one is much better than the first. But yeah! Thank you so much for listening in. Katie-Thank you: and I'm glad you're doing so well! Phew! Brett-Great info on the Pomona's Brett. And word is your canning this year is going well too. Did I read something about rhubarb jam? Cher-Aaah, thank you busy mom for listening in. I am making a note of your question and will answer it in next week's show. You are the second person to express being a little overwhelmed with a new garden/space. Patience and hard work, repeat that 100x. Marie-You can compost them, or, work them in the soil around the base of your plants. I will check if certain plants do better with them. I know from experience to not mound them up or they get moldy, at least in our cool NW spring weather they do. Moldy coffee grounds in the garden: echt. And as always, thank you for the kinds words Marie! Where do you go for infamous BBQ? Is it too early to plant tomatoes? Life lesson and deep thoughts as told in 3 acts. Oh hey. It's that time of year. Portland Gardeners, Mark Your Calendars Now!